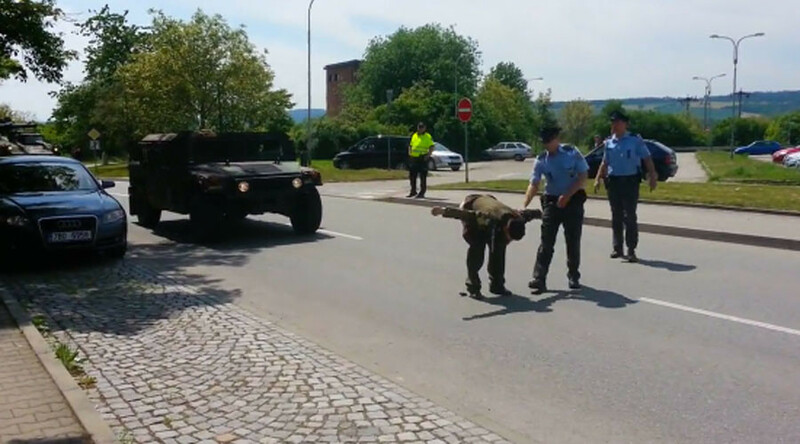 A Czech veteran opposed to the “aggressive missions” of the US in Europe has decided to take a stand against the major drills across central and Eastern Europe by launching a semi-naked protest. Martin Zapletal, a member of a group of Czech and Slovakian soldiers opposed to Nato, described the US soldiers as “aggressors, killers and occupiers” as Dragoon Ride II paraded through the country over the weekend. As the military tanks approached the town of Vyskov in the southeast of the country, they were halted by Zapletal after he walked onto the road, blocking the convoy. He then removed his trousers and mooned the army while some of the crowd cheered him on. Police are seen grabbing Zapletal before dragging him onto the sidewalk. Zapletal breaks away though and again moons the oncoming army tanks while giving them the middle finger, before being removed by police for a second time. The man who filmed the incident, as well as other onlookers, can also be seen giving the finger to the passing convoy while booing. Police arrested Zapletal who is understood to be facing charges of “disorderly conduct,” for which he could be jailed for up to the three years, according to Krajske Listy. The actions of the police have also been condemned by Zapletal’s supporters who say his arrest was “arbitrary” and “exceeded their powers,” as there are often “bare asses” in gay pride parades. “If this were not true, there would be people indicted several times already at the Prague City Hall and the US embassy,” said Ivan Kratochvil. More than 1,400 US soldiers and 400 vehicles are part of the convoy, which is making a 2,200km “tactical road march” from Vilseck in Germany to Estonia, before annual drills, the US army official website said. US and Czech soldiers took part in a joint exercise on Sunday, which focused on shooting and driving as well as testing the simulators of the Czech military combat vehicles. The American troops arrived in the city of Katowice in southwest Poland on Monday in advance of the US-led multinational exercise ‘Saber Strike 16,’ which is held annually in the EU since 2011.